I worked at a brew pub in high school that made the BEST spinach artichoke dip. Cheesy and rich, it was my favorite dish on the menu. These days, I prefer something dairy-free and way healthier—and this yummy appetizer does just the trick! It’s just as cheesy, ooey-gooey and flavorful as the original, but totally guilt-free. Perfect for parties! Reprinted from Homestyle Vegan by Amber St. Peter, Page Street Publishing Co. 2016. Drain the water and place the soaked cashews into a food processor or high-speed blender. Add the lemon juice, garlic clove, salt and pepper and begin to process them together. Add the water, 1 tablespoon at a time, until the desired consistency is reached. Preheat the oven to 400ºF (205ºC). In a food processor, combine the white beans, nutritional yeast, water, fresh basil, salt and crushed red pepper until smooth. Scoop the mixture into a bowl and set aside. In a medium cast-iron pan, heat the olive oil over medium heat. Sauté the garlic and onions together for 3 to 5 minutes, until softened. Pour in the chopped artichokes and stir to combine. Pour in the spinach, about a cup at a time, stirring to wilt. When the spinach has wilted, shut off the heat and pour in the white bean mixture, vegan cheese and about three-fourths of the bread crumbs. Stir to combine completely. Pour the remaining bread crumbs over the top of the mixture, then cover the pan with aluminum foil. Bake for 20 minutes. Remove the foil and bake for another 10 to 15 minutes, until the mixture is bubbly and hot. Let cool for 5 minutes, then serve with bread, chips or sliced vegetables! 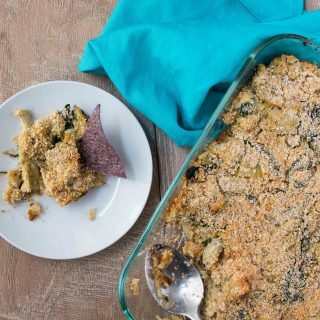 If after you’ve added the cheese and bread crumbs you’d like to scoop the mixture into a different oven-safe baking dish, go for it, but adjust the cooking time accordingly. You can serve any extra Easy Cashew Cheese with fresh chives and crusty bread for an easy appetizer.